Order Online - Shop our site and place an order. Order by Phone - Toll Free 1.866.667.8977, Monday - Friday 9:00 AM to 10:00 PM EST, Saturday - Sunday 10:00 AM to 6:30 PM EST. Please note: That by sending a check, your product may take slightly longer to arrive than the normal delivery time as we must wait for your check to clear our bank. Please note: That by sending a check, your product may take slightly longer to arrive than the normal delivery time. From our home page, you will be able to browse through the product categories or search for a product by product name, product number or description by entering your search terms in the search box located at the top right navigation of the site.Either method will retrieve a list of products, sizes available, and their price(s). To view a more detailed description of the product and its ingredients, simply click on "label information". Ingredients will be listed. If the label information is not available online, the “label information” tab will not be displayed. Once you have decided which product you would like to purchase, click on the Add to Cart button near the quantity. This will add the product to your Cart where you can select the quantity to purchase. If you change the quantity you wish to order, please remember to click the Update Cart button. You can also remove a product by selecting Remove from Cart. We have now made it easier, faster and more convenient for you to order with us. Are you pressed for time? Do you already know the item numbers of all the vitamins you are looking for? Simply use the Quick Order link on the bottom navigation bar, select products by Product Number as displayed in an ad, on this website or in a prior order. Please enter the product numbers you wish to purchase in the boxes and click Add items to Cart button. All of the items will appear in your cart for you to review, at which point you can change quantities, remove the item, continue shopping, or proceed to the secure online check out. Do you have a favorite item that you order again and again? With the “Favorites” feature, you can store your favorite items in a category created just for you. Easy one-click ordering will allow you to select which items you want to put in your shopping cart. To save items in your “Favorites List”, Click on the "Add to Favorites" button located on the product detail page. Using a combination of these methods will result in a quick, hassle-free, and safe way to place your future orders. Continue Shopping to add more items to your shopping cart. Update Cart to manually refresh your Shopping Cart. Begin Checkout to complete your order. Once you are ready to complete your order, you will need to provide us with your billing and shipping information or select from your saved addresses. If you have already created an account with us, you can sign-in at any time during your shopping session, including during check-out, and your billing and shipping information will automatically appear during check-out. Your credit card information WILL NOT BE STORED and will need to be re-entered. This is for the safety and integrity of your credit. If you do not wish to create an account with us, but wish to have your information stored for future orders, simply click the "remember me" option at the bottom of the billing/shipping information page and the next time you come to our site, your billing and shipping information will automatically appear. In order to take advantage of this feature, you must have your cookies enabled on your computer. After entering your billing and shipping information, click the "continue" button. This will take you to the "billing" page where you can review all of your billing and shipping information and modify any of it if necessary. Here, you will also be able to enter any coupon/discount codes you may have. Your final screen will give you a printable receipt of your order. Once you have verified your personal information and shipping options, you will need to enter your credit card information. Your final screen will give you a printable receipt of your order. Once you have completed your order, you will receive a confirmation e-mail that the order was received followed by a detailed e-mail with your shipping information including the final cost charged to your card. We reserve the right to limit quantities. Large quantity orders cannot be processed through our website. Please contact a customer service representative to assist you with your order. Toll Free 1.866.667.8977, Monday - Friday 9:00 AM to 10:00 PM EST Saturday -Sunday 10:00 AM to 6:30 PM EST. If you wish to cancel your order after it has been placed, simply send us an email asking us to cancel your order. If your order has already been processed, you will not be able to cancel your order, however, you may refuse the package for a full refund/credit. Customer Service 1.866.667.8977, Monday - Friday 9:00 AM to 10:00 PM EST Saturday - Sunday 10:00 AM to 6:30 PM EST. Vitamin World® takes pride in the quality of our products and pledges that you will be completely satisfied with your purchase. Your satisfaction of our product is completely guaranteed for 90 days from the date of purchase. If not completely satisfied, return the unused portion and we will promptly issue a refund for the purchase amount of the item. An original sales slip must accompany all merchandise returns. Vitamin World offers code-based promotions that can be redeemed online. Promotions and discounts, including free shipping, will be communicated on the website, through emails, and direct marketing, such as mailers or flyers. In the Cart, enter your promotion code in the space marked "Enter Coupon Code." Click the "Apply" button on the right side of the page. At checkout, enter your promotion code section located beneath the shipping address section. Prices for the items that are valid for the discount will be reduced by the amount of the promotion, and reflected in your ORDER SUMMARY. Your bonus voucher will contain a bonus code # which you can enter when ordering online. You will be able to enter this during anytime of your purchase in the box marked “Dollar Reward #”. You will also need to enter your Wellness Rewards™ membership # to claim the reward. Once you enter the necessary information, you will see the amount deducted in the "Estimated Total" in your shopping cart and “Order Summary” at checkout. If you are still having technical difficulties, please contact us at 1.866.667.8977. In order to use the 'My Favorites List' and/or 'Remember Me' features of our site, you will need to set your browser to accept cookies. This cookie information is not shared with any other party. Q: What are cookies and how does VitaminWorld.com use them? A cookie is a small text file that a website places on your computer hard drive when you visit that site in order to provide a more personalized browsing experience. In the upper-right corner of the browser, click on the three vertical dots to customize Google Chrome. In the pull-down menu, select Settings. Scroll all the way down the page and click on Advanced. In the Privacy and Security section, select Content Settings. From the menu, select Cookies. Click on the setting Allow sites to save and read cookie data (recommended) to accept cookies. In the upper-left corner of the browser, click on Safari in the main menu. In the pull-down menu, select Preferences. In the menu, click on the Privacy icon. In the Cookies and website data section, un-check Block all cookies to accept cookies. In the upper-right corner of the browser, click on the Gear icon. In the pull-down menu, select Internet options. Click on the Privacy tab. Then, click on the Advanced button. In the First-Party Cookies and Third-Party Cookies sections, click on the Accept radio button to accept cookies. Click OK. Click OK again. Free Standard Shipping on $49 or more (only available in the contiguous 48 states). ¹Please Note: Standard Shipping is available in all 50 states. Alaska, Hawaii, Guam and Puerto Rico may take longer to deliver. Delivery available to PO Box or APO/FPO addresses but may take longer. Standard Ground is available to all 50 States. Delivery to Hawaii, Alaska, Puerto Rico and Guam may take longer. Delivery 6 days a week Monday – Saturday. Delivery to PO Boxes available. Delivery to APO/FPO addresses available but may take longer. Delivery not available to PO Box or APO/FPO addresses. Orders placed Monday-Friday by 12 noon ET. will be delivered in 2 business days to the 48 contiguous states. Orders will ship pending verification of billing information. 2 to 3 days to Alaska or Hawaii. 2 to 4 days to Puerto Rico or Guam. Delivery not available to Puerto Rico, Guam, PO Box or APO/FPO addresses. Orders placed Monday-Friday by 12 noon ET. will be delivered on the next business day to the 48 contiguous states. Orders will ship pending verification of billing information. 1 to 2 days to Alaska or Hawaii. All International shipments will be charged postage costs calculated by weight and destination. U.S. currency only. Sorry, our free shipping offer does not apply to International orders. Our prices do not include taxes and tariffs. Customers outside of the United States may be subject to customs fees and/or import duties and taxes, which are levied once a shipment reaches your country. Additional charges for customs clearance must be borne by you; we have no control over these charges and cannot predict what they may be. Customs policies vary widely from country to country; you should contact your local customs office or tax authority for information specific to your situation. Additionally, when ordering from Vitaminworld.com, you are considered the importer of record and must comply with all laws and regulations of the country in which you are receiving the goods. International orders are shipped via DHL which can take approximately 2-3 weeks for delivery. Please contact Customer Service at 1.866.667.8977, Monday through Friday from 9:00 A.M. to 10:00 P.M. EST; Saturday through Sunday from 10:00 A.M. to 6:30 P.M. EST. We are proud of the quality of our products and want to make sure you are completely satisfied. Your satisfaction of our product is completely guaranteed for 90 days from the date of purchase. You may return any opened or unopened product for a full refund within 90 days of the purchase date. If 90 days has passed since your purchase has shipped, we apologize, but we can’t accept the item(s) for return. In the event the purchaser returns the items to Vitamin World outside the 90 days return policy, upon request the items can be returned back to the purchaser. It will be the responsibility of the purchaser to provide a return label and the associated shipping costs will be your responsibility otherwise the product(s) will be destroyed. We recommend using insured/trackable mail for these types of returns, as we cannot be responsible for items that do not make it back to us. Note: If you ordered more than 1 of a specific item, only 1 of those items may be returned opened. All other items must be sealed. Users who create a personal account with us, will be able to store all of their addresses with us thus preventing having to enter it every time. To create an account, simply select "My Account" at the top right of the page. From there, you will be able to register with us. You will also be able to register during your check-out process. If you do not wish to create an account with us, but wish to have your information stored for future orders, simply click the "remember me" option at the bottom of the billing/shipping page. The next time you come to our site, your billing and shipping information will be pre-filled for you! In order to take advantage of this feature, you must have your “cookies” enabled on your computer. If you forgot your username or password, simply go to the My Account – Log in page and choose "Forgot Password." You will then be able to enter your email address and we will mail you your username and password. If you wish to edit your account information, simply click the "sign-in/register" button located at the top left side of the page. Enter your email address and password then click the "sign-in" button. Choose "Update Your Profile," change any information you wish to change and click the "Update Your Profile" button located on the lower left hand side of the page. With the "Favorites" feature, you can store your favorite items in a category created just for you. Easy one-click ordering will allow you to select which items you want to put in your shopping cart. Step 2 - You should now your item(s) in your Favorites list. To remove an item(s) - Simply click "remove" located to the right of each item you wish to remove. Step 3 - To add an item to your shopping cart - Simply click the add to cart button. You should now see the item(s) you checked in your shopping cart. From here, you may either continue shopping or begin the check-out process. VitaminWorld.com reserves the right not to ship any product that they see fit for reasons such as delinquent accounts, import licenses, etc... if this happens you will be notified via e-mail and your credit card will be refunded. Some countries may require various types of licenses. 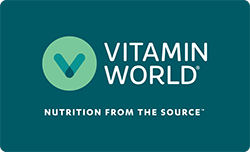 Vitamin World.com will not knowingly ship any products to any countries that may require any type of license. All sales are final. This means VitaminWorld.com is not responsible for any negligence on the part of the consumer. Prices on this website are subject to change without notice. This website is a summary of many health and nutritional media publications. It is not intended to cure, treat or prevent any diseases or conditions. As always, please consult your local health specialist before taking any of these listed products or starting any listed programs or procedures on this site. The products and procedures on this site have not been evaluated by the United States Food and Drug Administration, they are provided to you as a resource only. We are not responsible for any typographical errors. Vitamin World.com will not be held responsible for international orders that never make it past your countries customs office. Please check with your customs office before placing your order. No refunds will be given for items that are seized by your local customs agents. Prices are subject to change at any time without notice. We take great pride in keeping your personal information safe and secure. We use Secure Socket Layer (SSL) technology throughout the website and, importantly, through the checkout process to encrypt the information you send us when you place your order. The information is encrypted on your computer, sent through the Internet as jumbled code, and decoded on our secure server. It cannot be read in transit. We use GeoTrust as our certificate provider. To ensure that your order is being placed on a Secure Socket Layer, there are a couple of visual clues displayed by your browser. Second, you will see a green-colored, secured padlock in the browser’s URL location box no matter if you’re using Safari, Google Chrome or Microsoft Internet Explorer. Regardless of your browser, the VitaminWorld.com website will display these visual clues to reassure you that your information is being transferred securely. In addition, we will not divulge any information we receive from customers to anyone. We will not rent, sell or give your name or credit card information or purchase history to any other company, agency or individual.